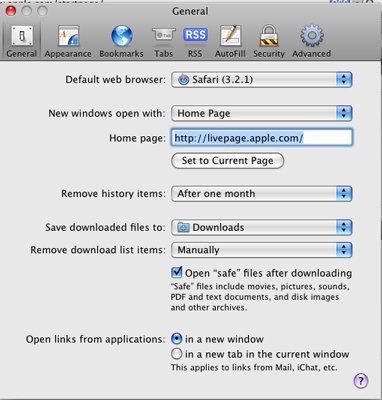 Mac OS X Snow Leopard lets you choose the home page that Safari goes to when you connect to the Internet. Choosing a home page is one of the easiest methods of speeding up your Web surfing, especially if you’re using a dial-up connection. 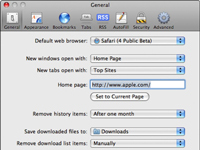 However, a large percentage of the Mac owners have never set their own home page; instead, they simply use the default home page provided by their browser! 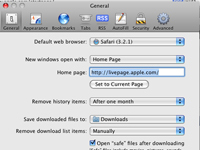 1If you want to use a specific Web page as your new home page, display it in Safari. A page with few graphics will load faster. Alternatively, press Command+, (comma). The Preferences dialog displays. 4Click the Set to Current Page button. Alternatively, click the New Windows Open With pop-up menu and choose Empty Page if you want Safari to open a new window with a blank page. 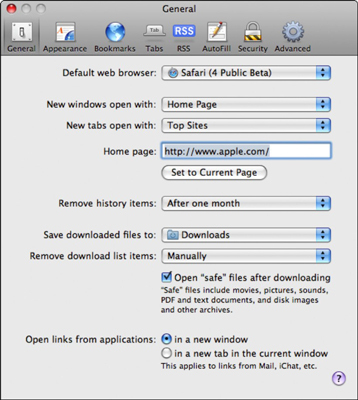 5Click the Close button to exit the Preferences dialog. Now you can visit your home page at any time by pressing the Home button on the Toolbar.